SAN FRANCISCO, July 19, 2018 ― Semtech Corporation (Nasdaq: SMTC), a leading supplier of high performance analog and mixed-signal semiconductors and advanced algorithms, announced that Vivek Mohan, Director of Internet of Things (IoT) in Semtech’s Wireless and Sensing Products Group, will present at the upcoming Google Cloud Next ’18 event in San Francisco from July 26-28. 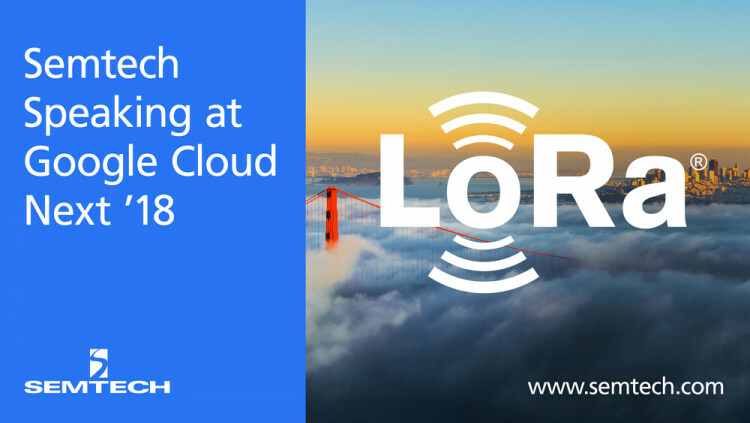 Recently, Google joined the LoRa Alliance™, the fastest growing IoT Alliance for Low Power Wide Area Network applications. The key points of the presentation are expected to assist developers, system integrators and Internet of Things (IoT) innovators to build innovative and unique use cases for a variety of industries. The long range and low power capabilities of Semtech’s LoRa® devices and wireless radio frequency technology (LoRa Technology) offer key advantages compared to other LPWAN protocols, making LoRa Technology the DNA of IoT. According to business information provider IHS Markit, more than 40 % of all low power wide area public network connections are expected to incorporate LoRa-based devices and represent the preeminent LPWAN solution in 2019. Google Cloud Next ’18 is a three-day conference held at the Moscone Center in San Francisco. Topics range from Cloud-based technologies and computing, to advanced data analytics and IoT implementation. The conference is attended by developers and passionate industry experts to share ideas and offer many learning opportunities. All statements contained herein that are not statements of historical fact, including statements that use the words “will,” “to build,” “designed to,” or other similar words or expressions, that describe Semtech Corporation’s or its management’s future plans, objectives or goals are “forward-looking statements” and are made pursuant to the Safe-Harbor provisions of the Private Securities Litigation Reform Act of 1995, as amended. Such forward-looking statements involve known and unknown risks, uncertainties and other factors that could cause the actual results of Semtech Corporation to be materially different from the historical results and/or from any future results or outcomes expressed or implied by such forward-looking statements. Such factors are further addressed in Semtech Corporation’s annual and quarterly reports, and in other documents or reports, filed with the Securities and Exchange Commission (www.sec.gov) including, without limitation, information under the captions “Management’s Discussion and Analysis of Financial Condition and Results of Operations” and “Risk Factors.” Semtech Corporation assumes no obligation to update any forward-looking statements in order to reflect events or circumstances that may arise after the date of this release, except as required by law.